A specific fusion of behaviors and mindsets characterizes the next generation of leaders. That special combination of behaviors and mindsets is something we call "open leadership." We study it very closely. Because if we can understand, document, and actively cultivate it, we know we can build an organization full of innovative and passionate people enabling the best in one another. Let me explain what it makes it so powerful. Open leadership isn't something anyone can learn by reading a single book or skimming a checklist. It's deeper than that—something that's part of your organizational culture. And as our CEO, Jim Whitehurst, likes to say, changing culture to make it more open is difficult, because it involves trying to influence not only how people work (practices) but also what people value (principles). 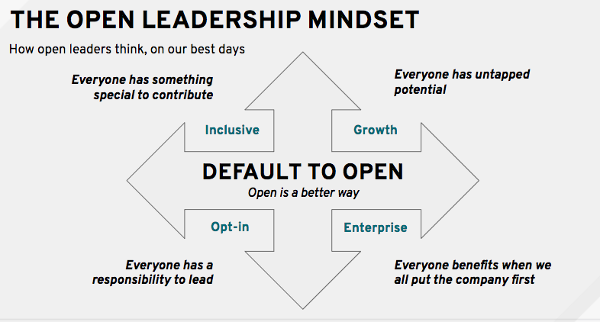 Like any other facet of organizational culture, open leadership is both a set of values or principles (mindsets) that people embrace, and a collection of practices (behaviors) they exhibit because of those beliefs. Open leaders don't just embrace open principles (like transparency, inclusivity, and community) when working to inspire, guide, or assist others. They actually prefer working this way. Simply stated, they "default to open." Open leaders tend to be transparent about both their goals and constraints, sharing data and resources as widely and thoroughly as possible. Open leaders create inclusive environments by drawing diverse and disparate groups of stakeholders into productive conversations and establishing the conditions for pointed yet respectful dialogue. Rather than simply issue commands, open leaders take great care to provide teammates with both sufficient context for the challenges they face and the lattitude to make innovative decisions. Open leaders constantly seek the best ways to align their teams' actions and behaviors with their organizations' mission and goals. Those are some pretty powerful behaviors! And they work. The most successful leaders at Red Hat are those that earn respect by thinking and acting the open source way. Open leadership isn't something anyone can learn by reading a single book or skimming a checklist. It's deeper than that. Everyone has something special to contribute. Everyone brings something unique to the organization, and a leader's role is to act in an inclusive way that cultivates those unique talents. Everyone has untapped potential. Everyone is capable of learning and growing, and a leader's role is to establish the conditions for people to stretch themselves. Everyone has a responsibility to lead. Everyone can be a leader in an open organization. But they need to cultivate their brand, since someone won't simply hand it to them. Everyone benefits when we all put the company first. Everyone wins when we enable one another to achieve our shared goals and purpose. When these mindsets interlock with the leadership behaviors we've observed, we see extraordinarily powerful effects. That fusion of open mindsets and open behaviors is open leadership's energy source. It's the fuel for creating truly innovative and resilient organizations and propelling them confidently into the future. That fusion of open mindsets and open behaviors is open leadership's energy source. It's the fuel for creating truly innovative and resilient organizations and propelling them confidently into the future. At Red Hat, we're interested in helping everyone tap into that energy to be leaders who contribute at their best. To do that, we've developed a framework that Red Hatters can use to guide their own open leadership activities, one they can adapt to their specific roles—wherever they might be in the organization. We call it the "Red Hat Multiplier." Connect. Contribute and connect others to Red Hat's communities and shared purpose. Extend trust. Show confidence in the ability of others to contribute. Be transparent. Openly share information and intentions. Collaborate. Invite cooperation and productive dialogue to create better solutions. Promote inclusive meritocracy. Empower others to contribute ideas and value solutions based on their merit, regardless of source. That last one is especially important: We find that open leaders work to create a context where everyone can thrive by contributing at their best. Open leaders create a community with shared purpose, where everyone harnesses their individual strengths and talents to unlock their full potential. Leaders work differently in open organizations. So how can you cultivate them?